Please be informed that, the applications for ASEAN Business Awards 2015 are now open! 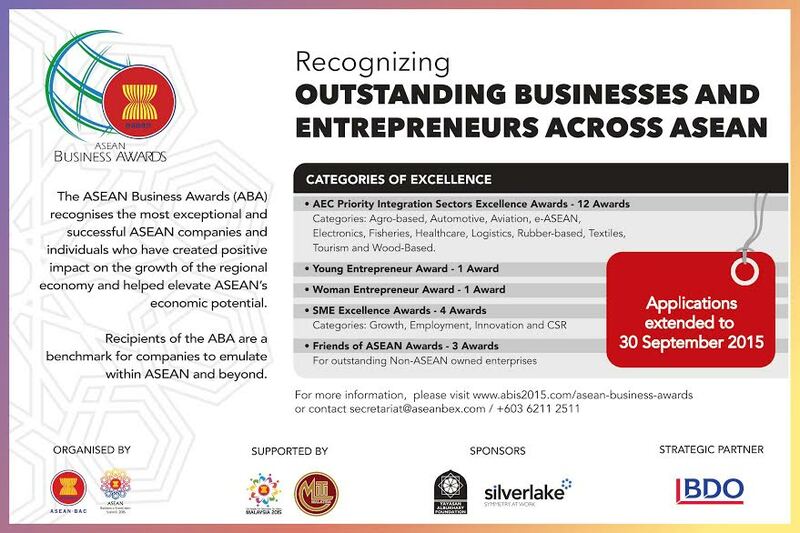 This award is organized by ASEAN Business Advisory Council (ASEAN-BAC) and supported by Ministry of Finance. The ASEAN Business Awards (ABA) recognizes the most exceptional and successful ASEAN companies and individuals who have created positive impact on the growth of the regional economy and helped elevate ASEAN's economic potential. Recipients of the ABA are a benchmark for companies to emulate within ASEAN and beyond.